Illustration © The Estate of John David Roberts. Reproduced with the permission of the William Roberts Society. Text © David Cleall, from Christie's London, Modern British and Irish Art, 20 November 2013 (lot 6). Cockneys was undertaken around 1919 at a decisive moment for William Roberts as he considered the aesthetic direction that his work would follow in the post-war era. His recent role as war artist had required him to produce 'representational' rather than 'cubist' art. While working within these constraints, Roberts nonetheless produced uncompromising work on a spectacular scale. In 1919, while his large war canvases were exhibited at the Royal Academy, he turned to non-war subjects. Rudolf Stulik, the proprietor of the Hôtel de la Tour Eiffel in Fitzrovia, commissioned him to produce a large triptych to be mounted outside the restaurant's upstairs 'Vorticist' dining room. 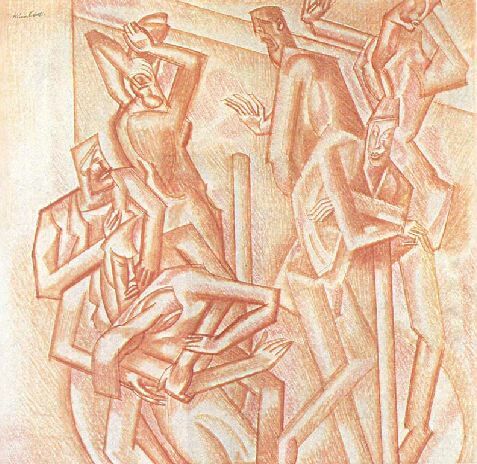 The two surviving panels, The Diners and The Dancers, maintained his pre-war experimental vigour and draw upon cubism, Vorticism and expressionism. Most intriguing in Roberts's works at this time was his depiction of the human figure. Despite possessing a remarkable talent for portraiture, Roberts is uninterested in individual characterisation; instead, his scenes are populated with social types. 'Cockneys', 'athletes' and 'builders' are presented as cylindrical and angular forms with simplified mask-like expressions. Works such as Athletes Exercising in a Gymnasium (Tate), Travelling Cradle /The Builder's Cradle (Southampton City Art Gallery and Metropolitan Museum of Art, New York ) and Behind the Scenes (private collection, San Francisco) share a similar approach to Cockneys and are also known only as studies. While Cockneys was worked up as a large oil painting, this was later destroyed and there are no known photographs. The Cinema (Tate) and At the Hippodrome (Leicester Art Gallery), both c.1920, give some idea of how the study might have been developed. The oil painting version, entitled Cockneys: A Street Scene, and one of the two studies for Cockneys were displayed at the Mansard Gallery, in Heal's, in MarchApril 1920 as part of the 'Group X' exhibition initiated by Wyndham Lewis. Lewis explained in the preface to the exhibition catalogue that Group X had been formed with 'no theory or dogma' but was motivated by the belief 'that the experiments undertaken all over Europe during the last 10 years should be utilized directly and developed' . Roberts's previous experience of exhibiting with Lewis at the Rebel Art Centre and being published in Blast magazine made him wary of being co-opted again. However, his work was sufficiently challenging to make it unlikely that it would find a market without an appropriate context. Writing in 1957, he recalled that the oil painting Cockneys: A Street Scene was bought by the artist, Eric Kennington but 'was left behind when Kennington moved from his studio. The new tenant [in 1935], Julian Trevelyan, returned it to me, and I destroyed it.' No explanation was given, but it would be uncharacteristic of Roberts not to value his early work unless, perhaps, it was damaged beyond repair. A watercolour study for Cockneys, squared for transfer, is of similar dimensions to the red chalk study and was sold by Christie's in 2003. It is not known which of the two studies for Cockneys was exhibited at the Mansard Gallery in the Group X exhibition. Group X (London: Mansard Gallery, 1920).